Three World Trade Center, also known by its street address, 175 Greenwich Street, is a skyscraper under construction as part of the World Trade Center reconstruction in New York City. The office building will be on the east side of Greenwich Street, across the street from the original location of the twin towers that were destroyed during the September 11, 2001 attacks. 195 Broadway is a 29-story building on Broadway in the Financial District of the New York City borough of Manhattan. It was the longtime headquarters of American Telephone and Telegraph, as well as Western Union for a time. It occupies an entire block on one side of Broadway, running from Dey Street to Fulton Street. It also has the address 15 Dey Street, well known as the site of one end of the first transcontinental telephone call. 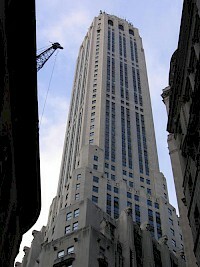 20 Exchange Place is a 59 floor Art Deco building in New York City. Formerly known as the City Bank-Farmers Trust Building, it was built between 1930-1931, for the newly merged National City Bank of New York and the Farmers' Loan and Trust Company, predecessor firms of Citigroup. It remained the company's headquarters until 1956 and was ultimately sold in 1979. The building was designed by the architectural firm of Cross and Cross. 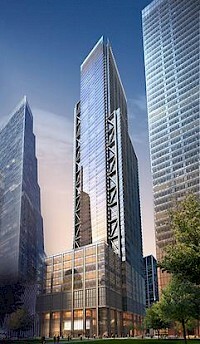 Two World Trade Center, also known by its street address, 200 Greenwich Street, is a new office building approved for construction as part of the World Trade Center reconstruction in New York City. 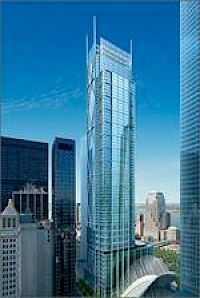 When completed, the tower will be located on the east side of Greenwich Street, across the street from the original location of the Twin Towers that were destroyed during the September 11, 2001 attacks. The 79-story building was designed by Foster and Partners, London. 245 Park Avenue (formerly American Tobacco Company Building, American Brands Building and Bear Stearns Building) is a 648ft (198m) tall skyscraper in New York City, New York. It was completed in 1967 and has 48 floors. 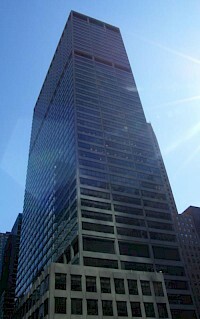 Shreve, Lamb and Harmon designed the building, which is the 57th tallest building in New York City. The Building Owners and Managers Association awarded the 2000/2001 Pinnacle Award to 245 Park Avenue. 3 World Trade Center (also known as 175 Greenwich Street) is a skyscraper under construction as part of the rebuilding of the World Trade Center site in Lower Manhattan, New York City. The project lies on the east side of Greenwich Street, across the street from the previous location of the Twin Towers, which were destroyed during the September 11 attacks in 2001. 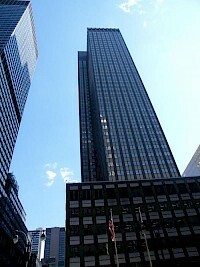 303 East 51st Street is a skyscraper currently on-hold status in the Turtle Bay neighborhood in New York, New York. The residential building is planned to rise 504 ft (154 m) with 44 floors. 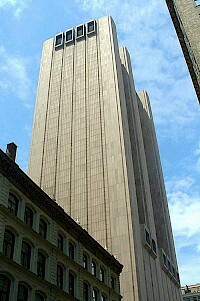 The former AT&T Long Lines Building at 33 Thomas Street is a 550 feet (167.5 meter) tall skyscraper in the Borough of Manhattan, New York, United States. It stands on the east side of Church Street, between Thomas and Worth Streets, in the Civic Center neighborhood of New York City. The building is an extreme example of the Brutalist architectural style, with no windows and a flat concrete slab facade. 345 Park Avenue is a 634ft (193m) tall skyscraper in New York City, New York. It was completed in 1969 and has 44 floors. Emery Roth designed the building, which is the 60th tallest in New York. 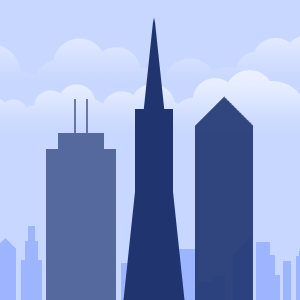 Among the building's tenants are private equity firm The Blackstone Group, and professional services firm KPMG. 360 Tenth Avenue is a skyscraper under construction in the Clinton neighborhood of Manhattan in New York City. It will be 772ft (236 m) tall and have 61 floors.